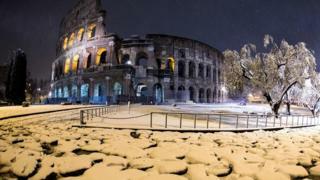 Cities across Europe have been hit by a Siberian snow blast this week - also known as "the Beast from the East". Even Mediterranean islands such as Corsica and Capri haven't escaped; parts of Spain and Italy have seen their first snowfall in years; and in the UK, there has been widespread disruption to transport and schools. But despite this wintry weather, in some places snow is actually getting rarer. For it to snow, you need a big enough cloud and, perhaps most obviously, temperatures close to or below freezing. Data from the principal organisations monitoring global temperatures all show they are rising. For example, according to Nasa, global average temperatures were 0.9C higher in 2017 than the 1951-80 average. And in the past 27 years, there is no year when annual global average temperatures have been cooler than the 1961-90 average. So how is this increase in temperature affecting snowfall? 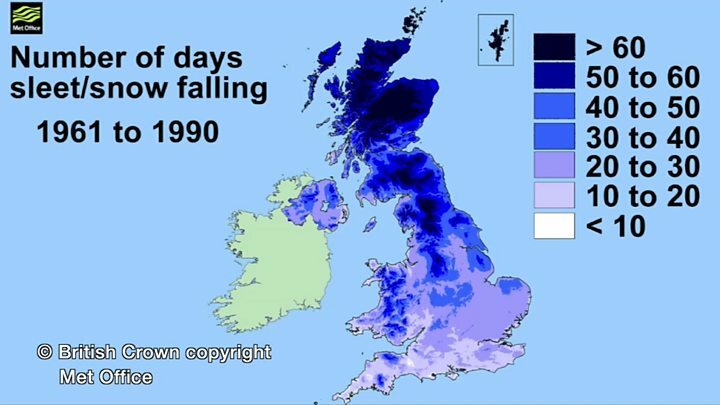 According to a report by the Natural Environment Research Council (NERC), there is evidence that the number of times snow is observed in a year has reduced - a sense of this change can be gained by looking at the animation below of data from the Met Office. If you look at Merseyside, for example, between 1961 and 1990, the area would normally have about 20 to 30 days of snow falling each year. By 1981-2010, that had reduced to about 10 to 20 days per year. Of course, there's variation across the country. Elevation of the land is an important factor as air cools by 1C for each 100m (330ft) increase in altitude, so upland parts of the UK have a greater number of days of snowfall than low areas. North-eastern areas have more snow than milder south-western areas. Snowfall in the UK is often difficult to predict, with 10ths of a degree Celsius making the difference between cold rain or snow - a nightmare for forecasters. However, the Met Office Regional Climate model simulation has shown that the trend of decreasing days of winter snow in the UK will probably continue. Will snow become rarer in other parts of the world? Not necessarily - it's a mixed picture. According to a report from the Intergovernmental Panel on Climate Change (IPCC) the fraction of precipitation falling as snow in winter has changed little in places that are more than 55 degrees north of the equator. That's because the air is already very cold and rising temperatures haven't made much difference. In some cases, higher temperatures have actually led to more snow. Around the Great Lakes of North America, for example, there's actually been a large increase in the amount of lake-effect snow observed. In the past, the Great Lakes would have been more often covered by ice in winter, effectively putting a lid on them and preventing moisture from evaporating into the atmosphere to make snow. With less ice on the lakes in recent winters, there's more evaporation - and so more snow. This may be due to more marginal temperatures or an earlier onset of spring there. So for some, snow could become rarer in the future, but this may cause further headaches. Disruption from snow tends to be worse in areas where snow occurs less frequently, whether from lack of investment in snow-clearing infrastructure, or people just being unused to the conditions. So even if snow does become scarcer in a future warmer world, that doesn't mean we'll see an end to problems on the roads, rails and airports caused by snow anytime soon.